Using Google Analytics to track clicks from email signatures is the only way to truly find out if your banners and CTA‘s are working. In this post, we will show you exactly how to track clicks from your email signature. After all, is it even worth running a marketing campaign without knowing the results? 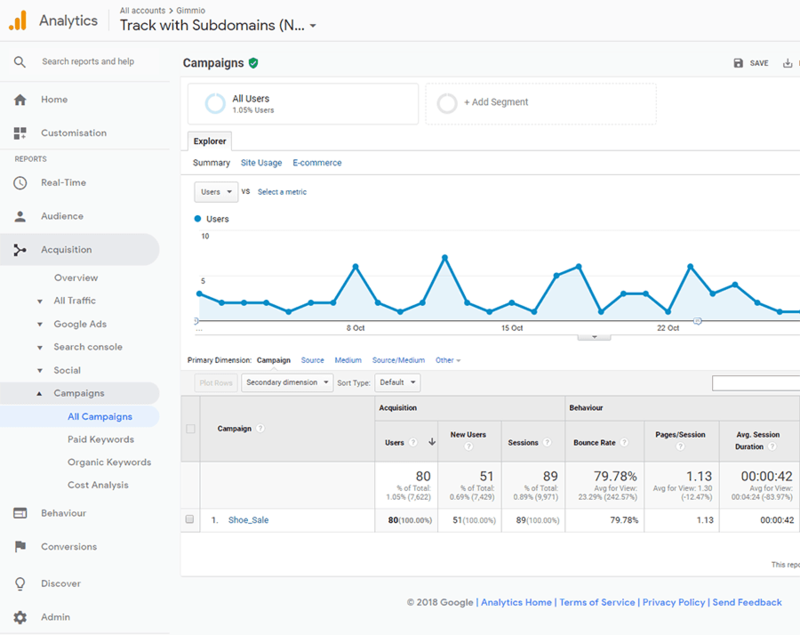 If you’re reading this article, we’ll assume you already know what Google Analytics is, and that you already have an account set up. If you don’t, take a look here for instructions on how to set up an account. Note: You can only track clicks to your own website that you control. If you have a link in your email signature pointing to a third party website, you won’t be able to track those clicks. 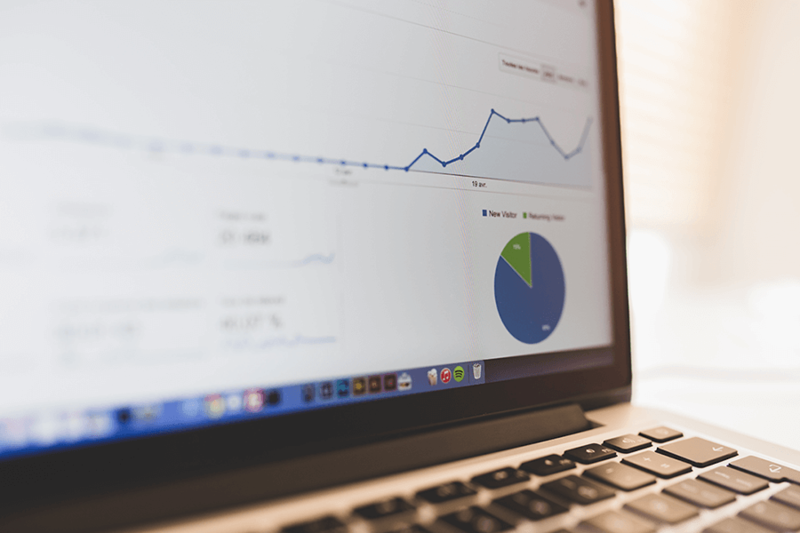 A bit of background on Google Analytics if you don’t already know what it is and how it works. Its primary purpose is to provide you with analytics about the people who visit your website, how they use it, how they got to your website, what actions they took on your website and much more. 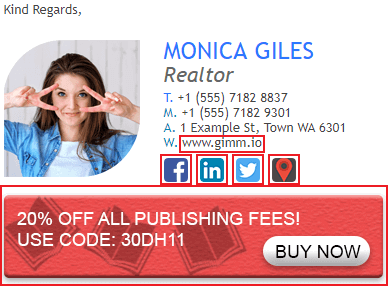 You can insert tracking links into any element of your email signature. For example, your banner, CTA, marketing message, the website link or even your logo. What you track is up to you. However, if you decide to track multiple elements, you will need a separate UTM tracking URL for each one so you can tell them apart in Google Analytics. UTM stands for “Urchin tracking module”. In order to set up tracking for clicks in your email signature, we will first need to create a UTM tracking parameter and add it to the end of your website URL. There is a really easy way to do this by using this tool. Website URL – This is the URL of your website, such as “https://www.zippysig.com”. Make sure you include the protocol prefix “http://” or “https://”. Campaign Source – This is the source of the campaign, such as “Banner” or “Newsletter”. Campaign Medium – Enter the medium you’re using to perform your marketing, such as “Email”, “CPC” etc. Note: You cannot have spaces in URL’s, so you will need to use underscores ( _ )to indicate a space. Once you’ve filled in all the information, you should get a new automatically generated URL at the bottom. This is the URL you will use to track your clicks. Now that you’ve created your UTM tracking link, you will need to copy it and paste it into the relevant area of your email signature. By far the easiest way to add tracking to your email signature links is by using a tool like this one. 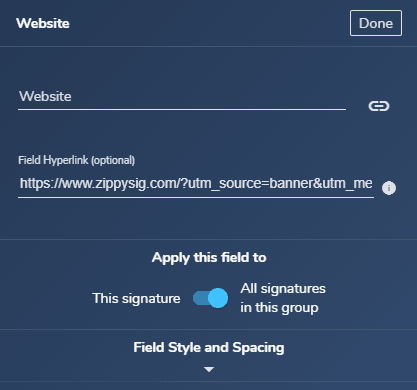 Using a tool to do the job makes it so much easier since you will never have to dabble with HTML code or make sure you don’t accidentally break the whole signature. Adding a UTM tracking URL to an email signature can be difficult if you don’t have experience modifying HTML code. Here is a quick rundown on how to do it. Firstly, you will need to open your email signature in an HTML editor such as Sublime. Find the current URL that is in the signature by pressing Ctrl + F in Sublime and typing in your website address that is currently in the signature. Once you’ve found the current URL, change the URL to your new UTM tracking URL, save your signature and install it into your email client. If you’re not 100% sure how to modify HTML code correctly, take a look at our guide on how to create an email signature. Once you’ve installed your UTM tracking code into your email signature, you will need to give Google Analytics some time to populate all the data. A good way to test if its working is to click on the link yourself so that some data comes through to Analytics. It can take up to 24 hours to Google Analytics to show data. Note: You will not be able to get historical data of your clicks from before the tracking code was installed. You will find a campaign in there with the name you specified when creating the UTM tracking URL. You will then be able to use this data in conjunction with all your other Google Analytics data. For example, you would find out if any of the tracked clicks resulted in sales or goal conversions quite easily. The point of this whole exercise is to get more in-depth knowledge on how well your email signature marketing is performing. To create a successful marketing campaign, you will need to track all the clicks in your signature to see what resonates with your audience and then try and improve on it to get even more clicks. 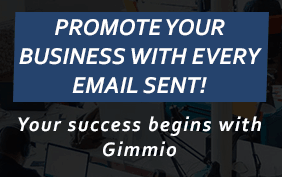 One of the advantages of using an email signature tool such as Gimmio for this task is that you can quickly and easily change banners, marketing messages, buttons and UTM tracking URLs. This makes is super easy to perform split testing (A/B testing) to find out what really works, without guessing. Previous Post« Previous We’ve Added 10 New Email Signature Templates!